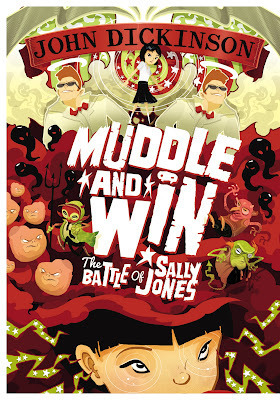 In Muddle and Win by John Dickinson, all humans are assigned an angel and a demon that battle for control over their subject. Being Bad and Being Good depends entirely on who can persuade you to their side. Sally Jones has never done a bad deed in her life, much to the chagrin of the demon Corozin who has been sending agent after agent to turn her Bad. When Corozin decides to let Muddlespot (an imp he created out of a wart) to be the next agent on the assignment, Muddlespot knows that whatever happens with Sally Jones will be the making or breaking of him-literally. It’s tough enough for Muddle to turn Sally because of the horde of angels guarding her, but when the angel Windleberry is hurriedly assigned to Sally, his job becomes all the more tough. Can he turn Sally Bad? 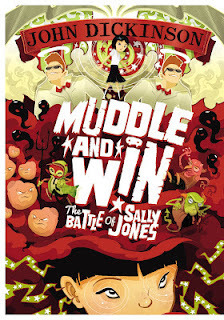 Muddle and Win is a fun, delightful and wacky story that’s very fast paced and full of vivid images. Dickinson has a wonderful imagination and the way he described the brain of Sally Jones and more importantly, the battle between good and evil, felt very unique. The narrative style is memorable as there was no waffle. I raced through this funny and adventurous short book. I enjoyed the way Dickinson included many points of view without it becoming confusing or convoluted. All the characters were fantastic. I particularly liked Muddle as he grew as a character. Ismael and Scattle, the angel and demon assigned to Sally’s sister Billie, were very funny. The tension between Sally and Billie was written well. Sally’s cat Shades was so much smarter than everyone gave him credit for. If you’re looking for a wild ride, Muddle and Win is the one to read. This book is perfect for middle grade readers. This sounds like such a cute story! I keep meaning to read it myself too! I've heard of this before - it sounds quite cute and funny! Nice review! I have seen this book around and it does seem very interesting.